Some years ago, I had a very good friend make me this dish as a holiday gift. I brought it home and Craig was SO in love with it, I had to get the recipe. So after much badgering of my friend, Katrin, she relented and gave me the recipe. I have made this again, and again, and we both absolutely love it. Since making it, we have named it Shrimp ala Katrin, in honor of my friend. 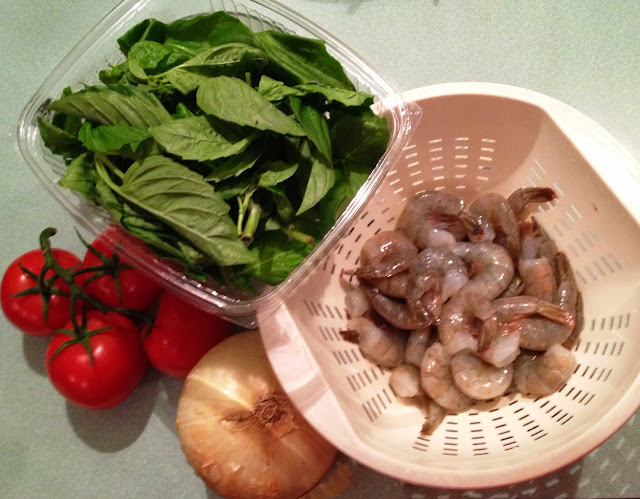 I have altered the recipe from time to time, depending on what I have and what we want…..more shrimp, less tomatoes, more onions/garlic, fresh thyme or oregano with the fresh basil. But the basics are always the same. Prep all of the vegetables, peel the shrimp, set aside. Heat a circle or two of olive oil in a medium pan. Add Shrimp, onions and garlic, sauté until onions are transparent and shrimp is pink. Add tomatoes and cook until all has formed a sauce. Add basil , stir and serve over rice.